The real estate market in Kingstowne is showing no signs of slowing down. March was another strong month for sales, let's check in on the numbers and then talk about the story behind them. Days on the market decreased from February to March, the lowest we’ve seen in 2018. 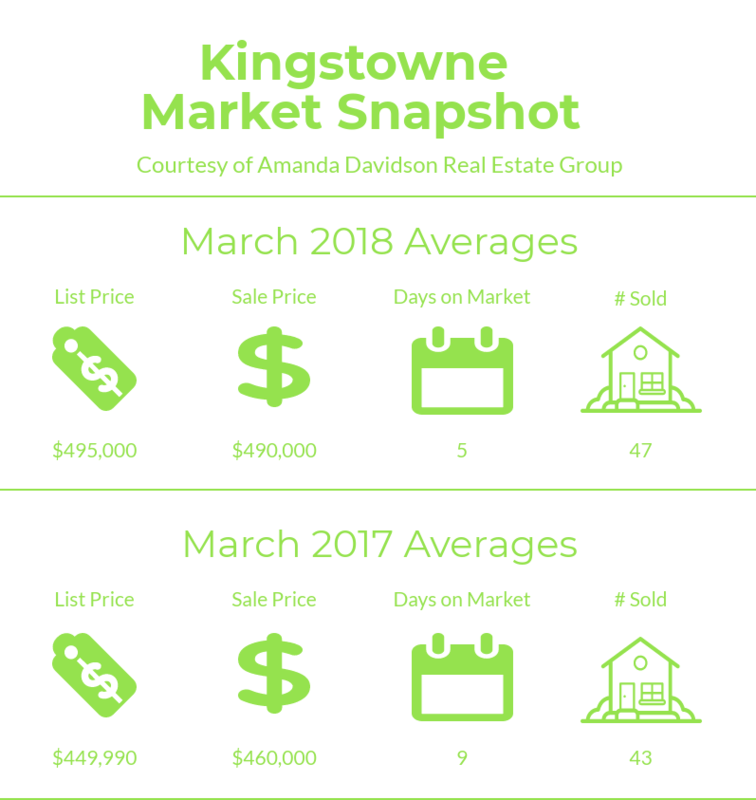 Coming in at just 5 this statistic is very telling of the current seller’s market Kingstowne is experiencing. Sellers are seeing over 99% on the sale to list price ratio and that tells us they’re having to do very little if any negotiating with buyers. There are currently 75 homes for sale in Kingstowne. View homes for sale in Kingstowne. Inventory is by no means plentiful and supply still isn’t keeping up with demand but, buyers do have more homes to pick from than they did this time last month. The spring market is in full swing and with new homes coming on the market regularly buyers are poised to secure their dream home. Although it’s a seller’s market that doesn’t mean every home sells quickly and for top dollar. Buyers are savvy and can spot an overpriced home when they see one. If you are selling your Kingstowne home it’s imperative that it shows well, is reasonably updated, and is priced correctly. The Kingstowne real estate market is competitive and when buying or selling you need a full-time agent that understands the strategies that are needed to be successful in a tight market. Buyers have to be prepared to act quickly, waiting days to tour a home can mean it’s already gone before you take a tour. Work with an agent who has the flexibility to move quickly when a new listing comes on the market. If you’d like to know more about the Kingstowne real estate market or have questions reach out to us. Find out the value of your Kingstowne home here – free estimate. Our home value tool is just a guide if you are looking for an accurate analysis of the current value of your home nothing replaces the expertise of a local agent with years of experience selling homes.